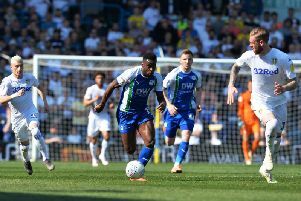 A double injury worry over Craig Morgan and Reece Wabara is the only cloud in the otherwise clear blue sky for League One table-toppers Wigan Athletic and their manager Gary Caldwell. Captain Morgan missed Saturday’s 5-1 win at Shrewsbury after damaging a hamstring in training, while Wabara pulled up lame at the beginning of the second half with a similar problem. Both men will be scanned today, knowing anything resembling a tear could rule them out for the rest of the campaign. “Craig felt his hamstring on Thursday, and we won’t know the full extent until we get it scanned,” revealed Caldwell. “Reece felt his hamstring a little bit, and again it was more precautionary. “We’d discussed changing it anyway at half-time, and that allowed us to do that. There was better news concerning Michael Jacobs, who came on for the final quarter at the Greenhous Meadow after being out since January with a calf problem. “It was brilliant to be able to bring Michael on,” acknowledged Caldwell. “We spoke about it on Friday, and to be able to put him on the bench and bring him on if we had the luxury. “If the game was pretty much over it would be great to get him a few more minutes under his belt, to get his match minutes up. “And it’s great for him that we were able to do that. “We all saw his quality in the first half of the season, and what he brings to the team. “Even today we saw flashes of what he can do, although he will be rusty for a while as he hasn’t had a lot of games this year.